For some reason, I've always thought Balmain pieces were for mature ladies who lunch. But then again, I've always associated the label with Pierre Balmain and not Christophe Decarnin. 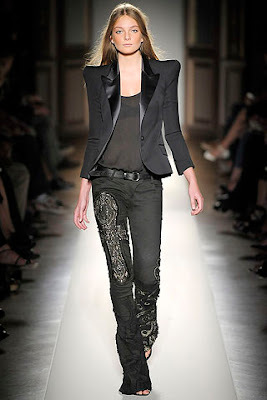 And ever since French Vogue Fashion Director Emmanuelle Alt has been seen about town wearing the newer, edgier Balmain, my interest for Balmain has been rejuvenated! See how Emmanuelle is rocking it...just effortless! If you think these pieces are drool-worthy enough, I'm not yet done! I leave you with the Balmain fringe ankle boot for F/W 2008 as seen on Vogue Nippon Creative Director Anna Dello Russo. I call it, The Minnetonka fringe boots' higher, badder, runway sister! so do u live in the states or PI? Me too grace! With all my heart! French girl style is my ideal, now French Vogue girl style - that's the ultimate diba! Hehe! Skinny leather pants- now that takes serious guts! It's still among my can't-pull-off-evers! love the post. she is an icon.